Discussion in 'The Connoisseur' started by Touchofevil, Jun 19, 2016. I love food. I enjoy (probably more than Is normal) reading what the wonderful members of the Lounge eat for breakfast, lunch, and dinner. But what is it you enjoy between meals? What do you snack on? What is it that ruins your appetite and adds on those extra pounds? Today, here at the House of ToE, it was a few avacados and a lot of chips and salsa. Had a homemade strawberry, banana, mango smoothie earlier (between lunch and dinner) today. Roast peppers sliced drizzled with olive oil and piled on bread. Humpty Dumpty's Bar-B-Q Potato Chips. A Maine tradition since 1948 -- even though they're now made in Canada. Since my operation 6 months ago, mostly cashews and pistachios. I've put back less than a pound of the 10 lbs I Iost since then. Currently working my way through a bag of Doritos. It will put on those ten pounds scottyrocks is looking for. I am currently snacking on some onion bread. Fading Fast and Touchofevil like this. 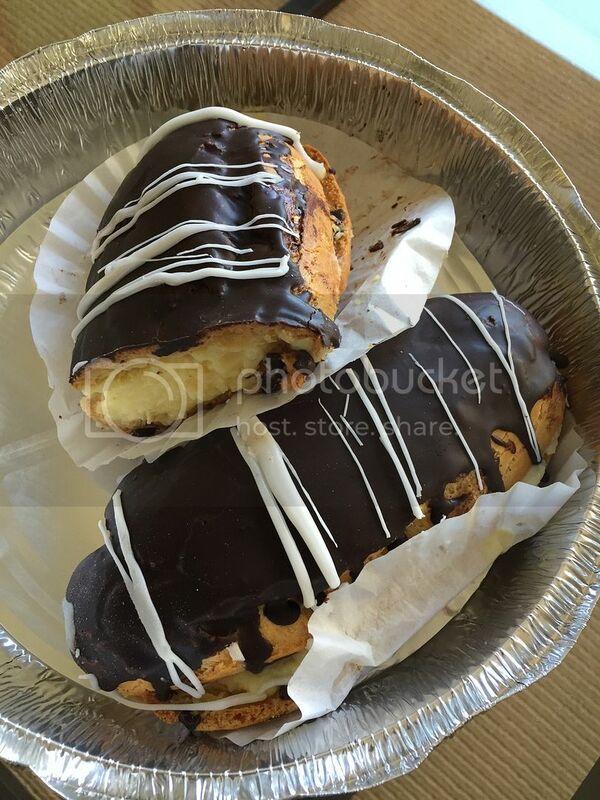 A giant eclair from a local diner that has taken me the better part of the last two hours to work through - quite a fun snack. Below is an archival picture of them from a different day, but they look exactly like the one I'm just about to finish. green papaya, Touchofevil and Bamaboots like this. That would take quite a few cups of coffee to down. It is an eclair on steroids. It took me a few hours to work my way through, but it did serve as lunch. The center has an almost custard-like consistency that is ridiculously tasty and nicely cut by the puff pastry and rich chocolate shell. A mighty fine eclair and, if I do say so myself, a mighty fine effort at polishing it off . Bamaboots and Touchofevil like this. Good work. Now, go slip into a sugar coma and relax. Forgot to post this yesterday. My girlfriend has two broken toes, so I have become our shopper. Yesterday, amidst shopping for a bunch of boring healthy things - like fruits, vegetables, milk and eggs - I found time - - to stroll down the cookie aisle where I spied the "limited edition" Chocolate Chip Oreo. Even though I've found Oreo's limited editions to be a mix bag at best - a few good, a few not and a few atrocious - I knew I was going to try these. The only hard part was waiting until I got home. I'd rate them a solid B in packaged-cookie land. Nowhere near as good as the classic Oreo, but taken as a simple chocolate chip sandwich cookie, it was enjoyable. I enjoy the "mega-stuff" Oreo as the cream has always been what Oreos are about for me, but away from that, none of the other variations on the theme rise to the level of wonderfulness that is the original Oreo, but some, like the chocolate chip I just had are a fine, if not outstanding, cookie. BobHufford and HatLoverGirl like this. ⇧, love those and I love the wax packaging almost as much as the product. ^ Lady B's favorite snack cheese. Some Cheetos and Coke. Not exactly a healthy snack, but eh.